Only one week behind. 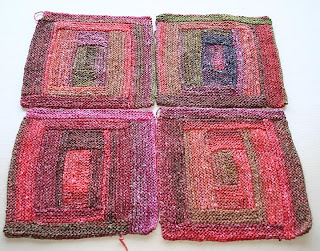 This - is now this - the four log cabin blocks I need for Anne's Cozy Cabin Jacket (Ravelry link; non-Rav link). I was supposed to have these done by last Monday's class, but - surprise! - I'm a week late in finishing them. 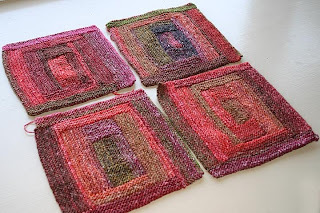 My goal is to seam these together, pick up the 160 or so stitches I need for the body, and have a few rows of garter stitch done by next Monday's class. 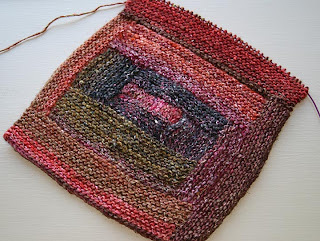 I think this is a realistic goal only because in seaming and picking up stitches I use what to me is the ultimate fiber tool - a crochet hook. e- remember that deal I told you about on Silk Garden? Well, I placed my order and when it gets here I too will be making one of these pretty jackets. I am so happy! !